How to Call Mexico from the U.S. Need to call Mexico from the United States? Learn how to call Mexico from the U.S.
Usually, it costs more to call cell phones than fixed landlines. You should make sure that you know which type of number you are calling – landline or cellphone – so you don’t get surprised by the cost. There are many different ways to call Mexico: using a call calling card, using your cell phone plan, or using a landline phone line. It is extremely important that you know what the charges are no matter how you are calling. What are the pay per minute charges? Does your cell phone allow international dialing? For calling cards there could be hidden connection fees or rounding of minutes that quickly add up. Always remember that the personal who is making the call pays the charges – this is technically referred to as a Calling Party Pays System (CPP). If you are looking for an affordable option where you don’t have to worry about minutes or who you are calling, we have some suggestions below. International calls to mobile phones in Mexico are dialed like regular international calls. So to call a Mexico City mobile phone from the U.S., dial 011 + 52 + 1 + area code + number. 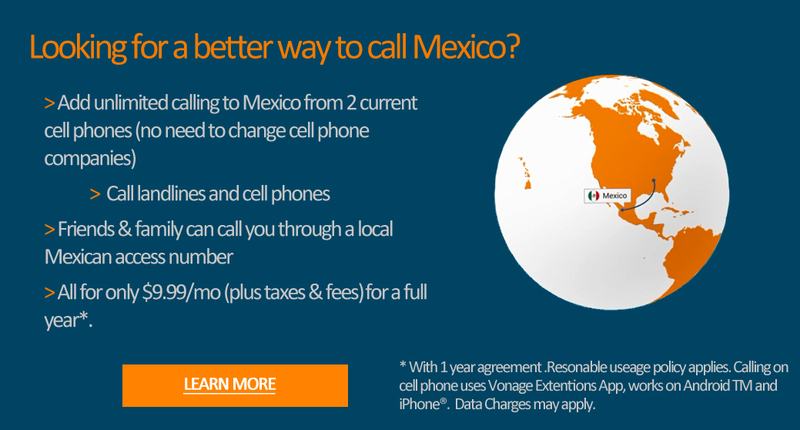 Introducing the new Vonage North America Plan with Unlimited Calling to Mexico! Includes unlimited¹ local and long distance home phone service across the U.S., Canada and Puerto Rico. Vonage North America is currently one of the best and easiest options available to call Mexico. You can call cell phones and landlines from 3 phones by signing up for 1 plan, for 1 low price. Instead of going through the hassle of changing your cell carrier, you can add Vonage to any carrier and as a bonus get a home phone included at no additional charges – just plug in any home phone (works with your high speed internet, cable or DSL). n Learn more about Vonage North America today! Finally, there is a way to make communication even easier! When your mom in Mexico City wants to call you, now she can. All she has to do is dial a special local Mexico access number, so a local call for her, and then once connected dial your number. No longer will you have to be the one to constantly call home, or call back after a hangup. Now your friends and family can call you from Mexico all they want.